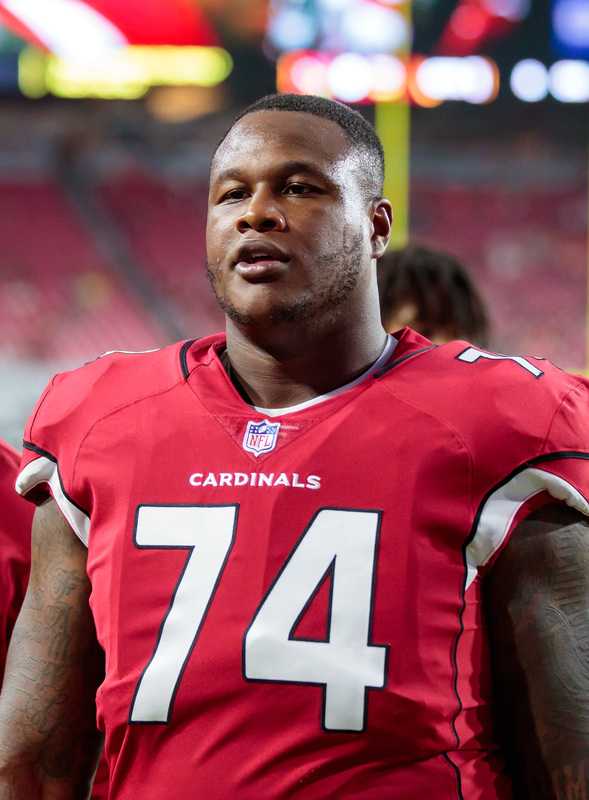 The Cardinals placed left tackle D.J. Humphries on injured reserve, according to a team announcement. In related moves, the club signed offensive linemen Joe Barksdale and Rees Odhiambo from the Colts’ practice squad. It has been a disastrous year for the Cardinals on the whole, but their offense line has been hit particularly hard by injuries. So far this year, the Cardinals have trotted out eight different combinations of starting offensive linemen, lost four different linemen to IR, and are presently starting none of their projected front five. Heading into camp, the Cardinals’ line was comprised of A.Q. Shipley, Justin Pugh, Mike Iupati, Humphries, and Andre Smith. The first four were knocked out by injury and Smith was released in November due to inconsistent play in his eight starts. Humphries, who turns 25 on Dec. 28, has been out of action since suffering a knee injury in the club’s Week 10 loss to the Chiefs. It’s a disappointing way for his season to end, and the Cardinals now have a decision to make regarding his future. The Cardinals can control him through 2019 thanks to his $9.625MM fifth-year option, but the deal is guaranteed for injury only. If the Cardinals want to move on from Humphries, they can cut him loose, provided that he can pass a physical early next year. The former No. 24 overall pick pick in the 2015 draft is no stranger to the injury bug. He was inactive for every game as a rookie and a knee injury limited him to just five games in 2017. The Chargers are waiving veteran tackle Joe Barksdale, a source tells Ian Rapoport of NFL.com (on Twitter). Barksdale also confirmed the news by tweeting his goodbye to the team and its fans. Barksdale, 31 in January, was inactive on Sunday due to a non-injury related issue. He appeared in just six games this season and only two contests in September and October. Barksdale was a starting tackle for the bulk of his career, but was relegated to a reserve role this year. The league’s other 31 teams will have an opportunity to claim him in the next 24 hours, but that’s unlikely to happen with one more full season to go on his four-year, $22MM deal. Barksdale saw just 144 snaps this year, his lowest output in years. He did not see enough action to qualify for ranking, but his 62.6 overall score from Pro Football Focus paints him as a below average protector. Prior to Vontae Davis‘ now-infamous halftime retirement, the 10-year NFL veteran cornerback told Bills defensive backs coach John Butler, “I’m done” while he was in uniform late in the first half. This one-sided conversation, per Davis (via The Undefeated’s Domonique Foxworth), occurred in the final minute of the half. Lafayette Pitts replaced Davis in the game and ended up having to play a larger role after halftime once Davis did not return for the second half. The Bills received a roster exemption after the 30-year-old defender’s retirement, and they placed Davis on the reserve/left squad list, Mike Florio of Pro Football Talk reports. While Davis sounds about as far away from a player who’d attempt a comeback, his placement on this list would not allow it — with the Bills or another team — this season. Jack Conklin‘s 2018 debut is unlikely to take place Sunday, Titans insider Paul Kuharsky tweets. In the final part of his recovery process from a torn ACL sustained in January, Conklin appears likelier to suit up in Week 4 against the Eagles than Sunday against the Jaguars. The Titans didn’t have Conklin nor Taylor Lewan in Week 2, but Tennessee’s left tackle has been cleared to return from a concussion he sustained in the season opener. Swing tackle Dennis Kelly, however, remains out. An illness forced Kelly to be hospitalized before last weekend’s game. Another AFC South tackle won’t play Sunday, but Anthony Castonzo‘s second hamstring setback in as many months has not caused the Colts to consider placing him on IR. Indianapolis’ left tackle remains week-to-week in his recovery, Frank Reich said (via the Indianapolis Star’s Zak Keefer, on Twitter). Were Castonzo to land on IR, he would not be able to return for eight weeks. Three Patriots deemed unlikely to play will, in fact, sit out New England’s Week 3 game in Detroit. The Patriots announced Trey Flowers, Patrick Chung and Eric Rowe are out against the Lions. The team did not declare Marcus Cannon or Josh Gordon out. Cannon returned to practice this week and made progress, pointing to the right tackle’s return. Vita Vea‘s calf strain will delay his debut for another week. The Buccaneers‘ first-round pick is out for Monday night’s Steelers game, Rick Stroud of the Tampa Bay Times tweets. Vea did practice on Saturday, doing so for the first time in a month, so the defensive tackle’s NFL debut appears imminent. The Chargers continue to bring Forrest Lamp along slowly. The 2017 second-round pick has not yet debuted, and Anthony Lynn said (via Jeff Miller of the Los Angeles Times) Lamp isn’t ready for action yet. “It’s just that Forrest was an athletic guard,” Lynn said. “He moved a lot and we pulled him in space. He doesn’t feel that speed yet. He feels like he’s a step behind.” Lamp tore an ACL a few days into his rookie training camp and underwent an arthroscopic procedure in May. The Bolts are already down Joe Barksdale for another week. They’ve been playing guard-tackle Michael Schofield in Lamp’s spot, and Sam Tevi started in Barksdale’s right tackle position last week in Buffalo. Marcus Mariota experienced difficulty gripping the ball after suffering a Week 1 elbow injury, but he could well return for the Titans this week. However, he doesn’t appear to be at full strength. Blaine Gabbert stands to see time as well as an apparent result. Mike Vrabel said he expects to use both of his quarterbacks against the Texans, via Jim Wyatt of TitansOnline.com (on Twitter). Mariota hasn’t made much progress since his injury in Tennessee’s opener and was still experiencing tingling in his throwing arm as of Wednesday, per Terry McCormick of TitanInsider.com, making this an interesting situation for a Titans team with playoff aspirations. If Mariota fails to progress by Sunday, it wouldn’t be hard to envision the Titans sitting him. Gabbert filled in for an injury-ransacked Cardinals team last season, making five starts (including a 12-7 win over the Titans). He completed 11 of 22 passes in a loss to the Dolphins last week. A higher-profile AFC passer does look to be in better shape going into Week 2. Ben Roethlisberger practiced fully on Friday, Mike Tomlin said (via ESPN’s Adam Schefter, on Twitter), pointing him toward being available in Sunday’s Steelers-Chiefs tilt. An elbow malady caused Big Ben to miss practice on Wednesday and Thursday. Joshua Dobbs would start against Kansas City if Pittsburgh’s franchise passer can’t go. When Mariota and/or Gabbert take snaps Sunday, they’ll do so with second-string tackles. Jack Conklin won’t be ready to debut, and Taylor Lewan is out as well after suffering a concussion, McCormick notes. Eric Berry‘s ninth NFL season remains on hold while he battles a heel ailment. The All-Pro Chiefs safety did not practice on Friday and is doubtful to suit up in western Pennsylvania on Sunday, per Andy Reid (via Brooke Pryor of the Kansas City Star, on Twitter). Berry’s battled this heel trouble, on the opposite foot of the torn Achilles he suffered in September 2017, for over a month. As expected, Joey Bosa is out for the Chargers-Bills game Sunday. Right tackle Joe Barksdale won’t suit up, either, ESPN’s Eric Williams tweets. A knee injury’s affecting Barksdale. Sam Tevi is likely to start for the Bolts at right tackle. Second-year defensive end Isaac Rochell replaced Bosa as a starting defensive end last week. Kelechi Osemele, G/T (Raiders): Five years, $58.5MM. $25.4MM fully guaranteed. Max value of $60MM via Pro Bowl incentives. Guaranteed base salaries of $6.7MM in 2016 and 2017. $6MM roster bonuses in 2016 and 2017 (Twitter links via Tom Pelissero of USA Today and Aaron Wilson of the National Football Post). Bruce Irvin, OLB (Raiders): Four years, $37MM. $14.5MM fully guaranteed. $19MM total guarantee. $6MM roster bonus in 2016, $2.25MM roster bonus in 2017 (Twitter link via Wilson). Joe Barksdale, T (Chargers): Four years, $22MM. $10.5MM fully guaranteed. $4MM signing bonus. Fully guaranteed $3.5MM salary in 2016. $3MM of $4.5MM salary in 2017 fully guaranteed (Twitter links via Wilson). Malik Jackson, DL (Jaguars): Six years, $85.5MM. $31.5MM fully guaranteed. $42MM total guarantee. $10.5MM of $13.5MM base salary for 2018 becomes fully guaranteed in March 2018 (Twitter links via Pelissero). Dwayne Allen, TE (Colts): Four years, $29.4MM. $4MM signing bonus. $16MM total guarantee (including injury guarantee). $5.5MM roster bonus in 2016. $2MM roster bonus on fifth day of 2017 league year (Twitter links via Wilson). Ben Jones, C/G (Titans): Four years, $17.5MM. $3.5MM signing bonus. $7.5MM guaranteed. $2.5MM of $3.5MM salary for 2017 is fully guaranteed. $500K roster bonus due in March 2016 (Twitter links via Wilson). Chris Clark, T (Texans): Two years, $6MM. $1MM signing bonus. $750K roster bonus due on March 16 (Twitter link via Wilson). Adam Vinatieri, K (Colts): Two years, $6MM. $1MM of $3.25MM salary for 2016 is guaranteed. Can earn $500K in field-goal percentage incentives each year (Twitter link via Wilson). Shareece Wright, CB (Ravens): Three years, $13MM. $4MM signing bonus. Up to $1MM annually in playing-time incentives (Twitter link via Wilson). William Gay, CB (Steelers): Three years, $7.5MM. $1.9MM signing bonus (Twitter link via Wilson). Ben Watson, TE (Ravens): Two years, $7MM. $2MM signing bonus. $3MM fully guaranteed. $1MM roster bonus due April 1, 2016. $1MM escalator for 2017 (Twitter link via Wilson). Tank Carder, LB (Browns): Two years, $2.5MM. $300K signing bonus (Twitter link via Wilson). Mario Williams, DE (Dolphins): Two years, $17MM. $4MM signing bonus. Fully guaranteed $4.485MM salary for 2016. $3.5MM of $8.45MM salary for 2017 guaranteed for injury; becomes fully guaranteed on fifth day of 2017 league year. Deal includes incentives for sacks, playing time, Pro Bowls (all Twitter links via Wilson). LaAdrian Waddle, T (Patriots): Two years, $2.35MM. $250K signing bonus. $200K annually in per-game roster bonuses (Twitter links via Wilson and Dave Birkett of the Detroit Free Press). TUESDAY, 10:27am: Barksdale’s new four-year deal with the Chargers is worth $22.2MM, with $10.5MM in fully guaranteed money, per Caplan (Twitter link). MONDAY, 8:48pm: Joe Barksdale was close to becoming one of the top right tackles on this year’s free agent market, but he’s staying put. Barksdale will re-sign the Chargers, according to Michael Gehlken of the San Diego Union-Tribune (Twitter link). It’s a four-year pact, reports ESPN’s Adam Caplan (on Twitter). Financial details are not yet available. “We got the deal done. I’ll be signing tomorrow,” Barksdale said. Barksdale proved to be a bargain for the Chargers last season after joining them on a one-year deal. The 27-year-old made 16 starts and played the second-most snaps in the league among tackles (1,150). His performance earned him the No. 21 overall ranking among 77 qualifying OTs from Pro Football Focus (subscription required). Barksdale, a third-round pick of the Raiders in 2011, joined the Rams in 2012 and emerged as a dependable starter the next season. Since then, he has appeared in 48 straight games and made 45 starts for the Rams and Chargers. 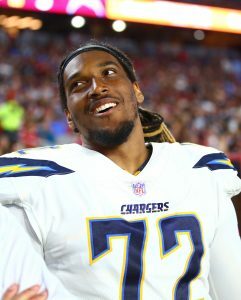 Right tackle Joe Barksdale hopes his upcoming foray into free agency goes smoother than it did last season, writes Tom Krasovic of the San Diego Union-Tribune. Barksdale notably remained unsigned until mid-May of last year before finally latching on with the Chargers, with whom he went on to start all 16 games. After settling for a base salary/signing bonus of just over $1MM in 2015, Barskdale should be able to get a pay bump this season, be it with San Diego or another club looking for offensive line help. Defensive line is a key area of need for the 49ers this offseason, says Matt Barrows of the Sacramento Bee. Defensive tackle Ian Williams is a free agent and could command a hefty contract on the open market, and the remaining options on the roster lack depth, as Arik Armstead, Glenn Dorsey, and Quinton Dial headline an uninspiring unit. But even if San Francisco fails to re-sign Williams, the club could use an early draft pick on a defensive lineman, and this year’s collegiate class is especially strong at that position. With OTAs starting next Tuesday, Tarik El-Bashir and Rich Tandler of CSNWashington.com discussed Washington‘s situation at quarterback. El-Bashir opines that Colt McCoy has the slight edge over Kirk Cousins for the backup gig, and Tandler believes undrafted rookie Hutson Mason could also put up a fight. ESPN.com’s John Keim hypothesizes that Washington could cut cornerback Tracy Porter and save $2.33MM, but the writer doesn’t believe the team has the necessary depth to make that move. ESPN.com’s Nick Wagoner says the Rams had interest in bringing back offensive lineman Joe Barksdale, and their offer to him early in the season was in the range of $2.5MM to $3MM. Barksdale ultimately bet on himself, and he ended up with a one-year, minimum salary deal from the Chargers. Drew Brees has said that he wants to play football until he is 45, but he admits that goal is a little bit unrealistic. “45 is a long way away,” the Saints quarterback said on ESPN’s SVP and Russillo, according to Joel A. Erickson of The Advocate. “I’m 36 right now, and I know I got maybe a little overzealous last year when I threw out the number 45.” Warren Moon, Vinny Testaverde, and Steve Deberg hung in there until they were 44, but those final years were mostly spent playing in reserve roles. Here’s more from around the NFL.. Along with free agent running backs Daniel Thomas, Ben Tate, and Felix Jones, Ronnie Wingo also worked out for the Cowboys today, as Clarence Hill of the Star Telegram tweets. Wingo was released by the Falcons earlier this month to help make room on the roster for incoming rookies. A judge dismissed domestic violence charges against former Ravens running back Ray Rice, as The Associated Press writes. Rice completed the terms of his pretrial intervention, which included $125 in fines and anger management counseling. Joe Barksdale, who signed a minimum-salary deal with the Chargers, was offered more from the Rams earlier in the offseason, Jim Thomas of the Post Dispatch tweets. Back in March, Barksdale looked like a decent bet to land a deal similar to the $6MM-per-year pacts signed by Austin Howard and Anthony Collins in 2014. However, that kind of market never materialized for the veteran. Pro Football Focus (subscription required) ranked the former Ram just 48th out of 84 qualified tackles last season. Falcons linebacker Joplo Bartu was fined $50,000 for an alcohol-related offense, but only after his two-game suspension was rescinded, according to Ian Rapoport of NFL.com. Bartu, who had 83 tackles in 2014, was handed a two-game suspension in March for his DUI arrest. Earlier this month, the linebacker brought new information to the league and his punishment was altered. However, future violations of the law will carry more significant discipline for him. Ravens rookie lineman Leon Brown hopes to land a roster spot with his hometown team, Aaron Wilson of The Baltimore Sun writes. The 6-foot-5, 332-pound former junior college All-American also had an invite to try out for the Jaguars, but he chose the Ravens instead. Brown, an Alabama product, went undrafted this year. 1:23pm: Barksdale gets a one-year, minimum salary contract from the Chargers, with a $350K signing bonus and an additional $1MM available in incentives, tweets Ian Rapoport of NFL.com. Those incentives are very reachable, a source tells Michael Gehlken of the San Diego Union-Tribune (Twitter link), who adds that Barksdale will be rewarded if he starts. 12:40pm: The last unsigned player on PFR’s Top 50 Free Agents list has found a new home, according to Rand Getlin of Yahoo! 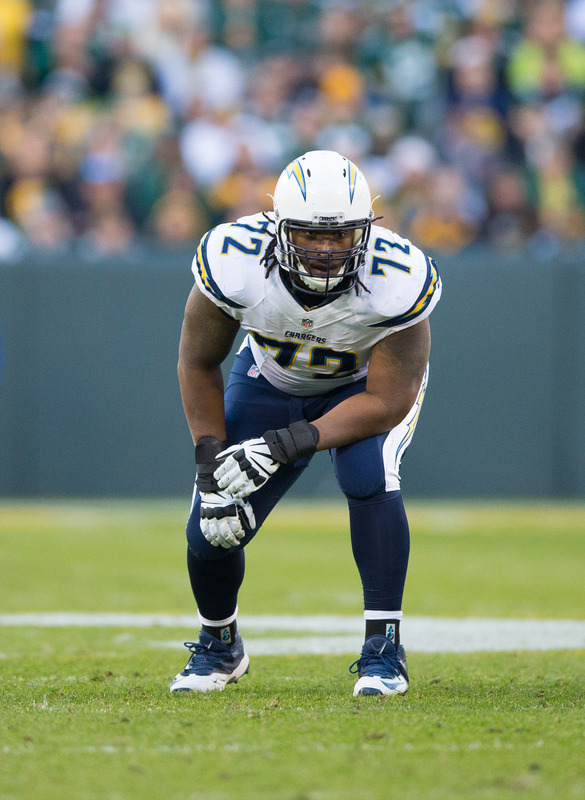 Sports, who reports (via Twitter) that offensive tackle Joe Barksdale has agreed to terms with the Chargers. Years and dollars on Barksdale’s new deal aren’t yet known. 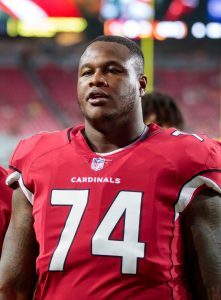 When I ranked Barksdale 36th overall among available players at the start of 2015’s free agent period, I observed that, given the lack of steady, reliable offensive tackles on the market, Barksdale looked like a decent bet to land a deal similar to the $6MM-per-year pacts signed by Austin Howard and Anthony Collins in 2014. According to various reports, Barksdale was seeking a contract in that range, or close to it, at the start of free agency. However, many teams in need of offensive line help opted to roll the dice on more affordable alternatives, or ones with more upside, such as the Jaguars with Jermey Parnell. As such, Barksdale’s asking price has likely been reduced significantly. As our Dallas Robinson observed when he examined Barksdale’s free agent stock, Pro Football Focus (subscription required) ranked the former Ram just 48th out of 84 qualified tackles. However, his +5.6 run-blocking grade placed him just outside the top 10 in that category. Barksdale, who previously worked out for the Falcons and drew interest from the Titans and Rams, visited the Chargers this week before agreeing to terms with the team. 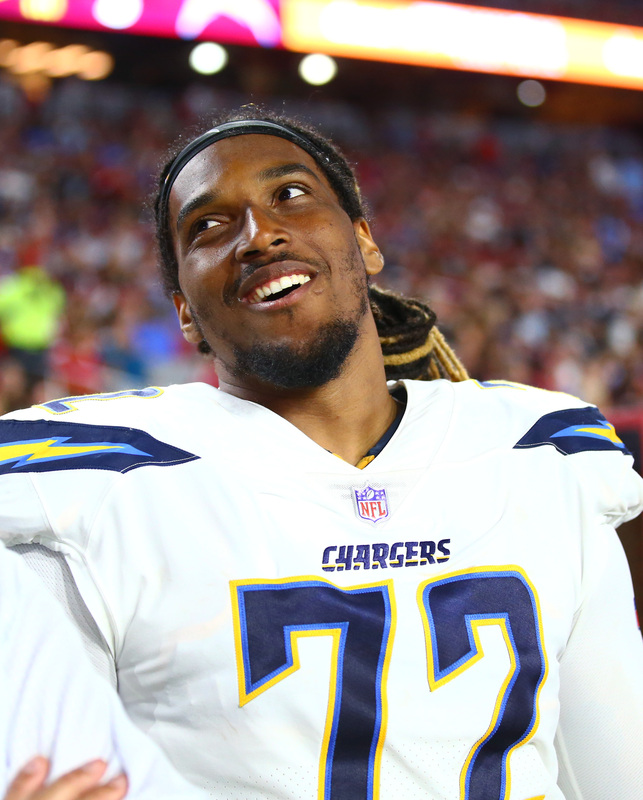 Having re-signed King Dunlap to play left tackle and added Orlando Franklin as their probable starter at left guard, the Chargers are set on that side of the line, but have some question marks on the right side. Although GM Tom Telesco suggested earlier in the offseason that he envisions D.J. Fluker playing right tackle in 2015, I’d expect Barksdale to challenge for the starting role at that spot, making Fluker a candidate to move inside.